EMI Noise Free! Will Not Affect Radio and CB Reception. Controlled Collapse Chip Connection technology or “C4” reduces the physical size of the LED light source to closely resemble a halogen filament which most headlights are mainly designed for. 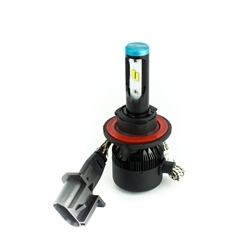 Results are a high precision light pattern while offering all the benefits of the LED technology. Cyron Elite bulbs greatly enhance your visibility and virtually eliminate glare for other drivers. That means added safety for you and all others on the road. Not DOT tested. Designed according to DOT specifications. Due to higher brightness of the LED bulb the headlight trim angle may need to be adjusted to avoid disturbing other drivers.